We’re going on holiday tomorrow. I’m declaring it an Internet Fast, at least to the best of my ability to do so when I still have actual access to the internet, so I’ve jumped the gun and have published YEAR OF MIRACLES on Amazon et all so I don’t have to do it while on vacation. …and her choices will ravage a city. 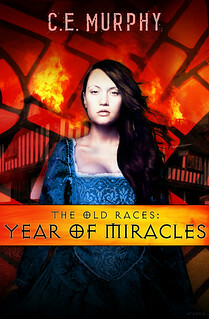 This is the story of London burning in 1666–the Year of Miracles. Travel safely and have a wonderful, relaxing trip. ooh have fun on the holiday! now I have to see if my Nook has recharged so I can check out the new offering.